A celebrities’ and A-lister’s favourite. Crystal Clear fans include the Duchess of Cambridge, Kate Moss, Gwyneth Paltrow and Colin Firth. It’s the ultimate star choice for silky smooth, younger looking skin. 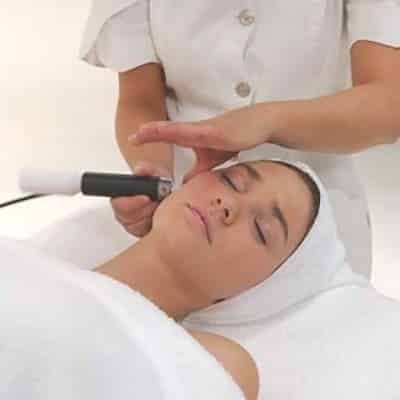 Our advanced Microdermabrasion uses ultra-fine diamond-hard aluminium oxide crystals to buff and polish the skin, gently removing dead skin cells layer by layer. The crystals are then vacuumed back up along with the exfoliated layers of skin, encouraging collagen re-growth thus boosting circulation and improving lymphatic drainage along the way. The gentle vacuum action also achieves an immediate lifting effect on tired muscles so skin looks instantly rejuvenated. With none of the downside of invasive treatments, our advanced Microdermabrasion instantly improves the texture of the skin and works on removing fine lines and wrinkles, clearing blocked pores, acne scarring, refining sun-damaged, ageing skin and as a beauty flash treatment for dull, tired-looking complexions. Our famous Microdermabrasion treatment offers a safe, controlled method of skin exfoliation. A flow of crystals is impinged directly onto the skin surface. The speed of crystals with their abrasive nature gently remove the epidermal cells layer by layer. In clinical trials, our advanced Microdermabrasion was conclusively proven to dramatically and visibly improve the texture and appearance of the skin, reducing and smoothing lines and wrinkles and producing more beautiful rejuvenated skin. The results speak for themselves – it’s been the Celebrity’s favourite treatment since 1996!